ANGER! Is there anybody who hasn't felt it? If ever there was a tale to pop in your head before acting, "Beth Gelert" is it. Anybody addressing the topic of Anger Management or Character Education and Values needs this story in their resources. Read the story first, it won't take long. After it I'll give both Joseph Jacobs' own notes on the story and additional online information including photos -- but please don't skip ahead as it will ruin the story. The story is given repeatedly by many people, but I think it's best told by Jacobs. He was an Australian best known for his collections of English and Celtic folklore and I've earlier posted a bit of that and a little of his Aesop fables. 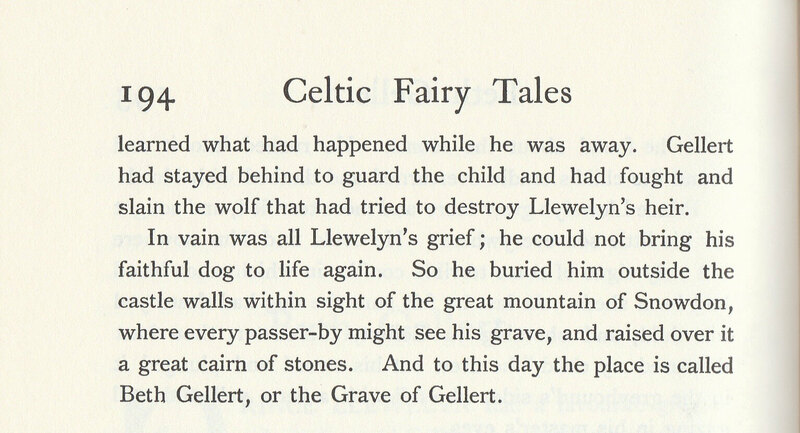 This comes from his book, Celtic Fairy Tales, published in 1892. That story has been told many times and even can be traced moving across the globe. Wait a second. I'm sometimes asked "Is that story true?" Well truth and what really happened or even if it happened as a story may retell it can be different things. To this day, a cairn of stones marks the place, and the name Beddgelert means in Welsh 'The grave of Gelert'. 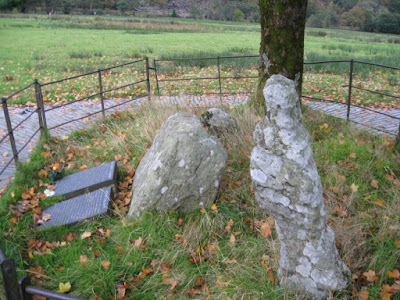 Every year thousands of people visit the grave of this brave dog; slight problem however, is that the cairn of stones is actually less than 200 years old! Nevertheless this story has great appeal. History and myth appear to have become a little confused when in 1793, a man called David Pritchard came to live in Beddgelert. 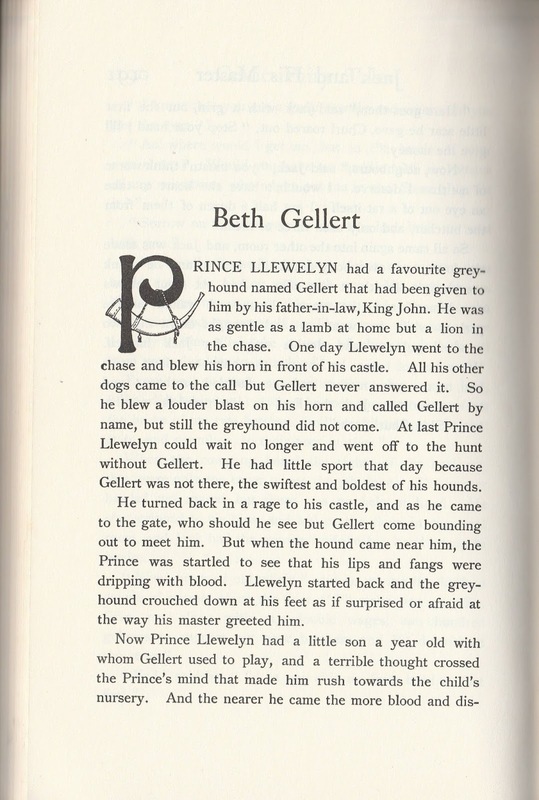 He was the landlord of the Royal Goat Inn and knew the story of the brave dog and adapted it to fit the village, and so benefit his trade at the inn. 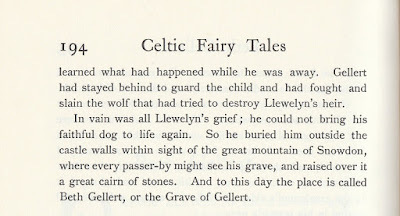 He apparently invented the name Gelert, and introduced the name Llywelyn into the story because of the Prince's connection with the nearby Abbey, and it was with the help of the parish clerk that Pritchard, not Llywelyn, raised the cairn! IrishWolfhounds.org. 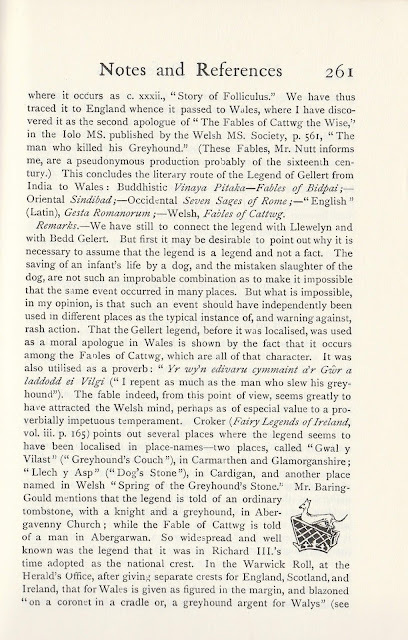 Their source is a postcard entitled "The Faithful Hound" and was published by Gwynedd Crafts, Beddgelert. The hound pictured was named Sean and sadly died in May, 1989 from osteosarcoma at the age of three. 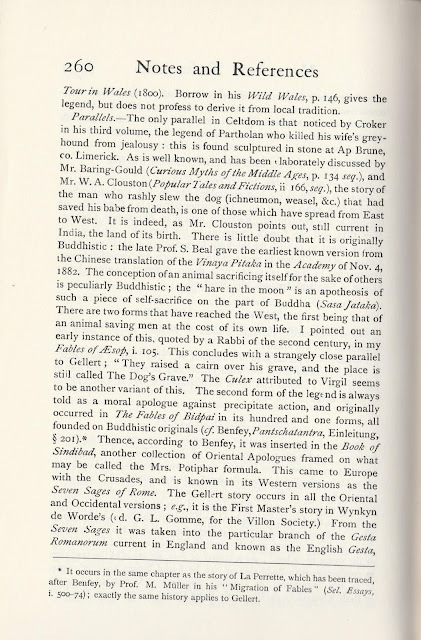 The site also gives the poem by William Robert Spencer, often given as a source and mentioned by Joseph Jacobs. If you are further interested in the Irish Wolfhound, the site mentions it's the "world's tallest breed of dog." 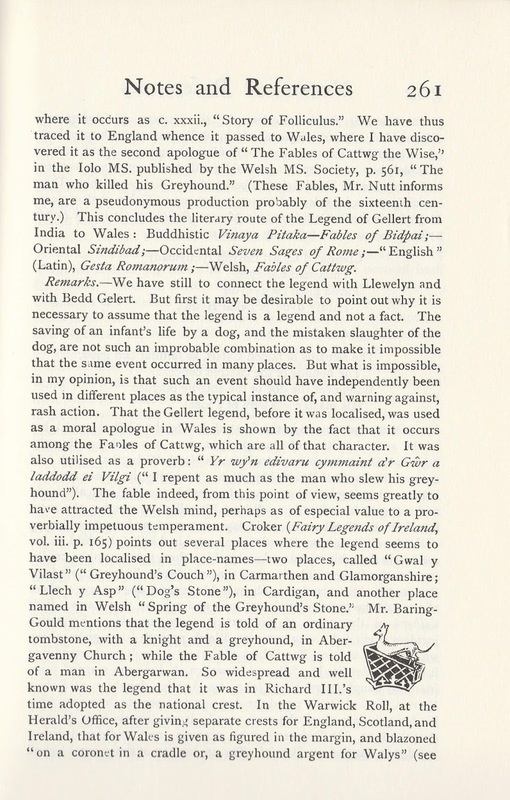 They also provide a great deal of information on the breed for Wolfhound fanciers and potential lovers of the breed. a comprehensive look at the legend and the Celtic myths behind it Croker (Fairy Legends of Ireland, vol. iii. 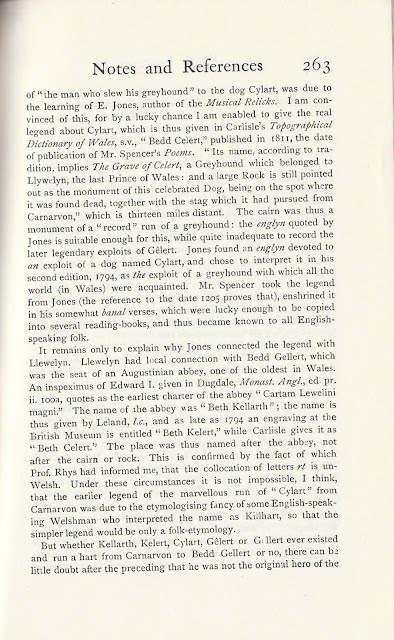 p. 165) points out several places where the legend seems to have been localised in place-names - two places, called "Gwal y Vilast" ("Greyhound's Couch"), in Carmarthen and Glamorganshire; "Llech y Asp" ("Dog's Stone"), in Cardigan, and another place. 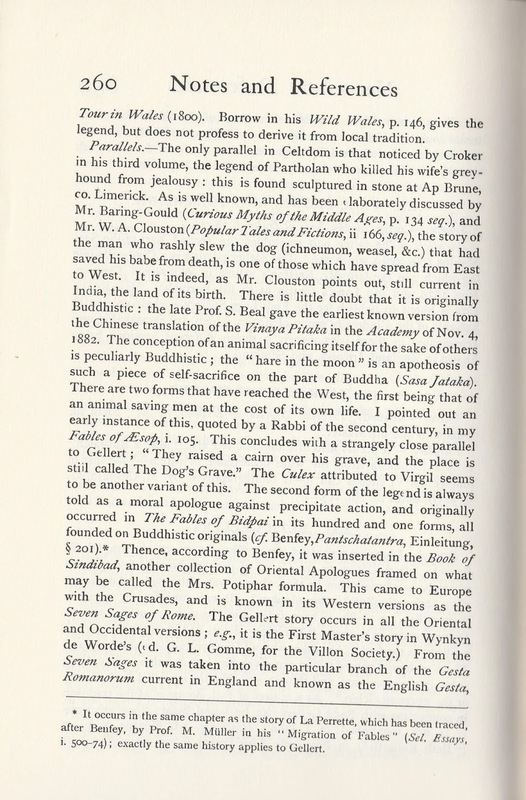 This concludes the literary route of the Legend of Gellert from India to Wales: Buddhistic Vinaya Pitaka - Fables of Bidpai; - Oriental Sindibad;-Occidental Seven Sages of Rome ; - " English" (Latin), Gesta Romanorum ;-Welsh, Fables of Cattwg. 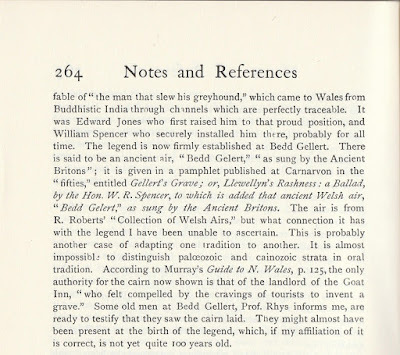 Angie Lake's article for The Megalithic Portal gives excellent, but small, photos of the site, along with maps of it. This photo is the largest. Angie Lake contributes regularly to the Portal which over the years has become a major team effort with input from thousands of photographers, archaeologists, locals and visitors. Ms. Lake is part of a team of voluntary editors and site admins for the Portal viewing ancient sites. Many of these ancient sites are not protected in any way, and many have disappeared over the last 50 years or so under development and intensive agriculture. Even sites that are scheduled have limited real protection, so their mission is to document, publicise and protect these remaining sites. 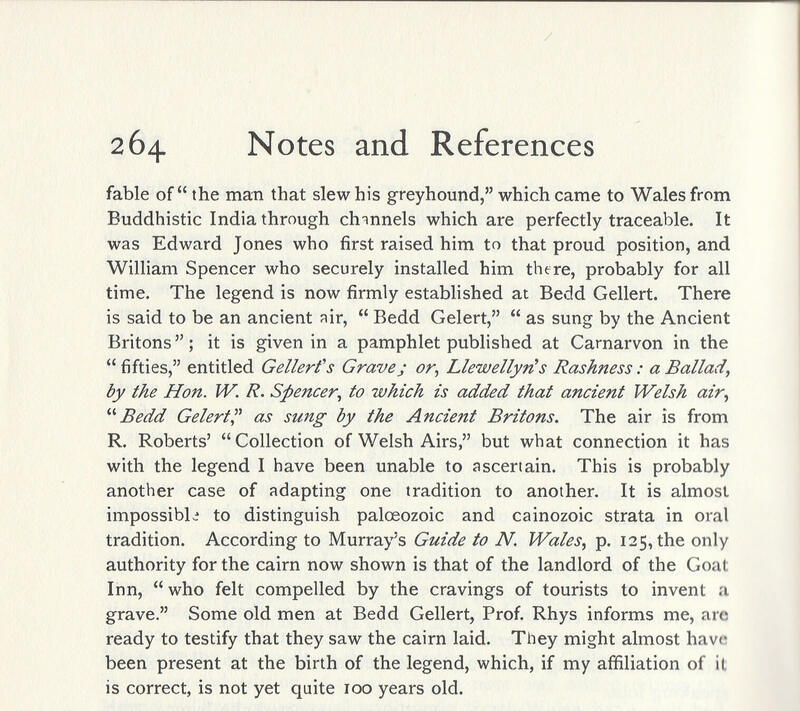 I love it when they say they're "creating a Hitchhikers' Guide to Ancient Sites if you like. Or - wait for it - Pokemonolith TM (Gotta catch 'em all :-)"
O.k. I've held up on posting Jacobs' own notes about the story. 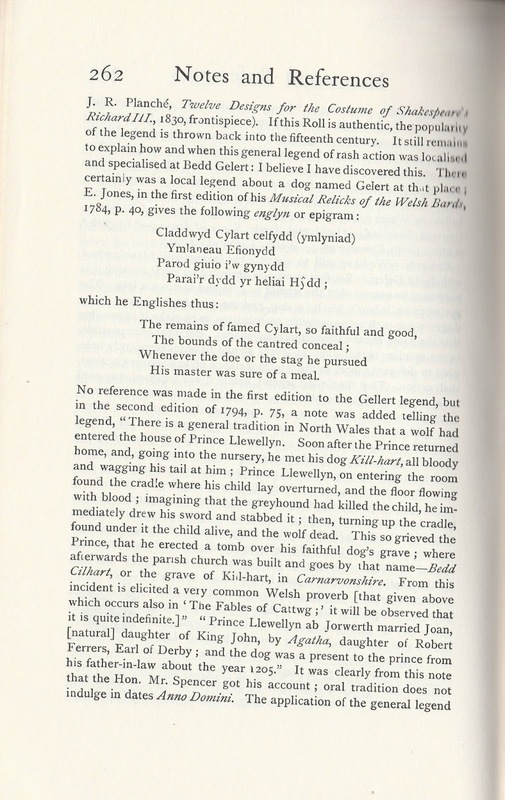 I'm afraid a lot of it fits the illustration he gives to the Notes and References section. He's certainly thorough -- it's longer than the story itself -- but feel free to skip through it, reading the parts that interest you. I certainly did. I meant to note, all illustrations in the story and notes are by John D. Batten. 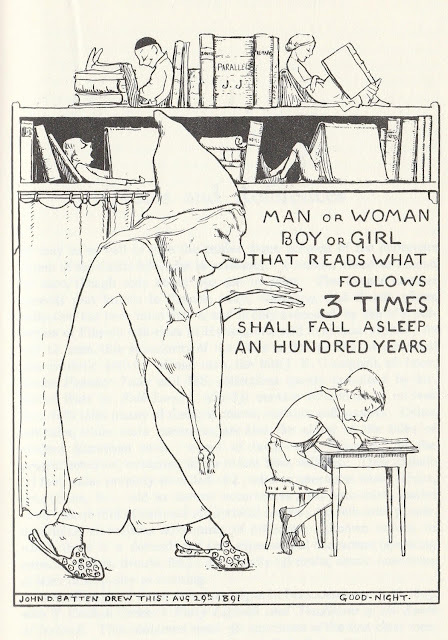 Hopefully you aren't indeed sleeping for "an hundred years." 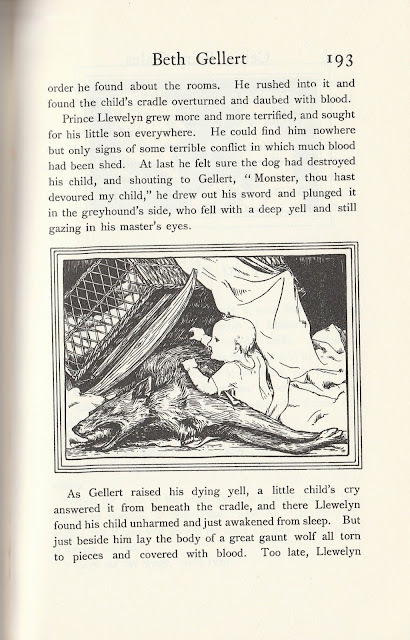 I'll close with my usual closing for days when I have a story in Keeping the Public in Public Domain.